So I purchased a Solar System for my kids. I am quite into space and wanted a model which I could use for a school homework project which showed the planets in their orbits during their journey around our nearest star, The Sun. 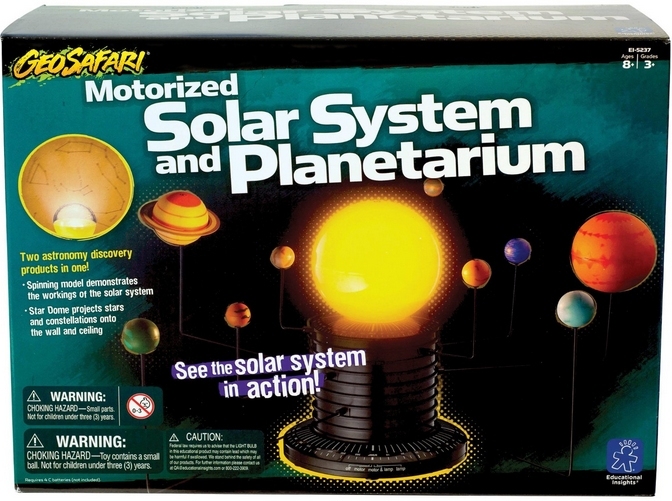 On a well known shopping site I came across the Learning Resources Geosafari Motorised Solar System, quite a large kids model in fact where the planets attach to metal rods which in-turn are fed into a motor which drives the orbits. Now some people will gripe that this solar system is not really accurate in a number of different ways, lets take a look at these moans because in fairness, it is really low cost so great when on a budget and you get what you pay for. If you want a scientifically accurate solar system model with different orbital speeds and solid brass planets, then you know where your bank card is – go for it. If on the other hand you want something ideal for teaching your kids with, then this is for you. Some people whinge that the solar systems planets aren’t realistic looking. Well, in truth, they aren’t. They are badly painted, for example the planet Jupiter doesn’t even have a great red spot on it. Earth is basically a blue ball with no detail at all and some of the others look like they just had a few blobs slung on them. But do not let this worry you – painting the planets is a project in its own right, and getting a book out or searching the Nasa website for Hubble space telescope planetary images provides you with more than enough information about how you can make the planets look more realistic. If you can be bothered that is. I’ve noticed more and more these days that many people seem to want spoon feeding (to put it politely) – well if thats how it is, then you will have to make do with the planets as they are provided, or go and spend hundreds on a different model. Personally I found painting the planets with my children both educational, fun and entertaining – but that’s just me, other people may not enjoy doing such things with their kids. I saw a review where someone was complaining that it was noisy. Well, you can hear the motor going round – so what? 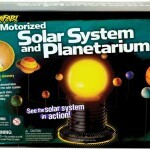 Have a look at our video and you will hear the slight noise this model gives out when the planets are orbiting the Sun. Big deal. On another note, the actual sphere of the Sun comes with two tops. One is plain yellow, thus representing the Sun, however another is clear plastic and has some star constellations printed in black on it. At first I was sceptical that these would show on a ceiling, but they do, and in a totally dark room, the bulb inside the orrery lights up bright enough to project fantastic sharp shadows on the ceiling, not of the planets of the Solar System, naturally, but of the stars which are printed on the dome. So when you read up that someone couldn’t see the projection, just ignore them. A small switch allows the owner to set the planets moving on their own with no light, or with light, or just have a light on for the stars. To power the solar systems planets and get them going round the sun, and to operate the bright bulb, you will need 4 type C batteries. There is also an adapter port on it which allows you to use some kind of mains power adaptor – although I haven’t tried this. The model Solar System will be taken into school by one of my boys for a homework project they are working on. Having spent time explaining that the planets orbit at different speeds and their distance from the Sun is not to scale, i’m confident he will give a good presentation and be able to inform his classmates all about space and the planets. I highly recommend this item, because despite its paintwork on the planets, the model works well and a bit of fun handywork gets round this issue whilst providing fun and education at the same time. As another quick note, there are no moons on any of our heavenly fiends – so as a next project I am going to make a moon for the planet Earth and for Jupiter I will do the four moons which Galileo Galilei spotted when he first look through his telescope at the stars and found out that there were other planets out there. These would be Io, Ganymede, Callisto and Europa. Also note that there is a Pluto on it aswell as Mercury, Venus, Earth, Mars, Jupiter, Saturn, Uranus and Neptune. Now some will argue about Pluto and whether it’s a planet – officially it is not, but hey, what better way to teach the kids than to show them a bit of history, and for the real pedantic idiots out there – guess what – you can unplug its metal rod if you don’t want it so you have the best of both worlds!!! Well worth the paltry amount I paid for it. - Poor planetary detail - just paint them if you are bothered.